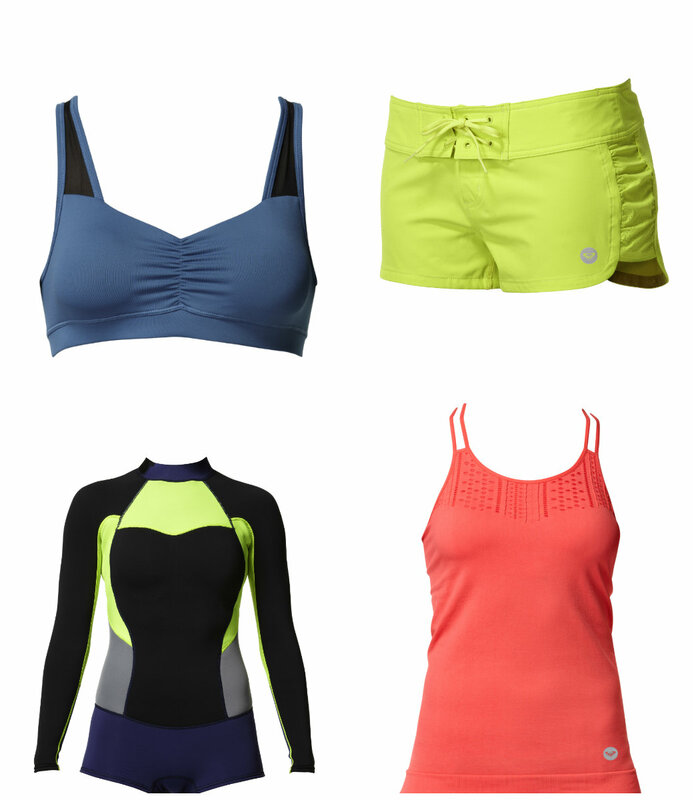 The Hip & Urban Girl's Guide: Workout Gear You'll Love To Wear from ROXY. Workout Gear You'll Love To Wear from ROXY. Getting fit has never been so stylish as more activewear brands tune into the fact that even though we're getting sweaty, gosh darn it, we still want to look cute! Don't tell me I'm the only vain one here, ladies! One brand that gets it is ROXY. 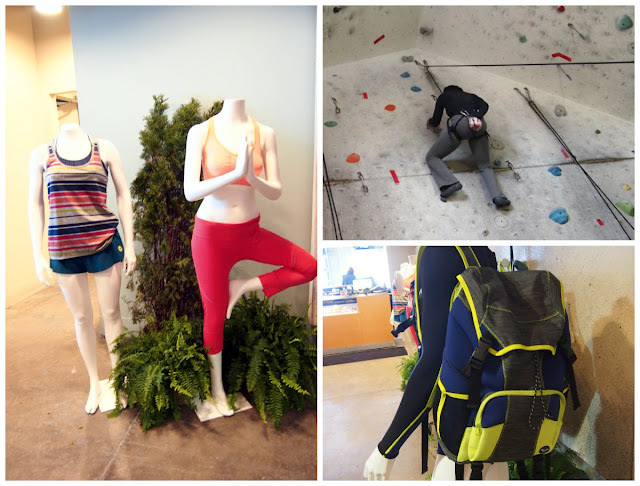 They recently invited us to test drive their new and very cute outdoor fitness collection with a rock climbing adventure at Joe Rockheads in Liberty Village. The first thing I noticed in slipping on my "Everyday Yoga Pants" and "Dawn Run Tee" were how soft they felt. The yoga pants actually felt like it had a bit of a warm fleece lining inside which I thought might make me hot when I actually started moving but all fabrics used are moisture wicking and breathable so I was super comfy. 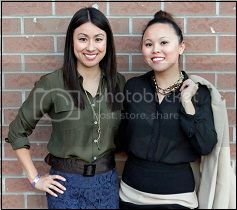 I also loved the silhouettes and details that were really designed to be flattering on my not yet buff figure. The 4 way stretch really holds it all in, if you know what I mean. Though my pieces were in charcoal and black (awesome because I can mix and match them with fitness gear I already have) my fellow mountain climbers were clad in vibrant teals and oranges, stripes, graphic prints and even some colour blocked pieces. Runway trends interpreted for activewear -- I'm in love. Along with looking and feeling great, I also learned ROXY's outdoor fitness line is designed with fabrics that offer UV protection and are both water repellent and quick drying for land and sea adventures. Perfect for that day I get brave enough to try paddle yoga (yes - that's a thing!). On the subject of bravery, rock climbing kinda scared me sh!tless but I have to say the experience was actually exhilarating, empowering and an incredible workout for my legs and core. If you think you lack the upper body strength to do this. Think again! It's actually all in the legs, a tip I learned from the awesome staff at Joe Rockheads. Note: Hubby also told me this before I head out that morning...but of course it's only valid coming from professionals, right? Anyway, days later my body is asking "What were you thinking?" 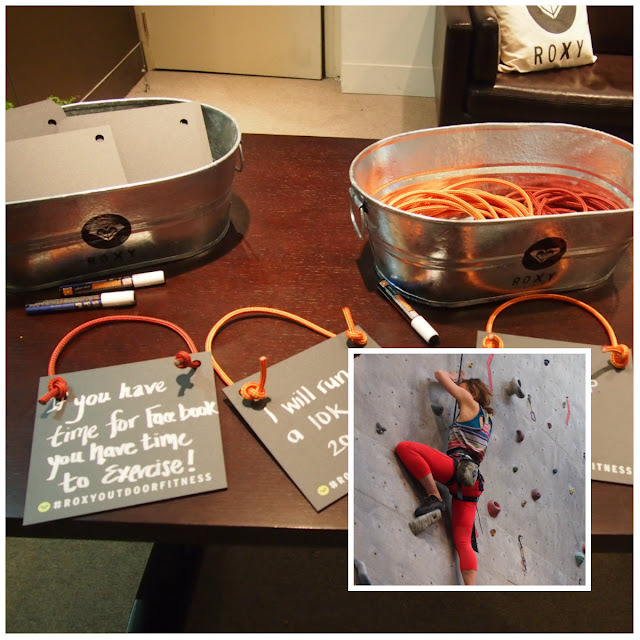 but I would absolutely go rock climbing again and I'd wear my ROXY pieces of course. Thanks again to ROXY for encouraging me to challenge myself with this awesome workout and the fab new gear. Now I really have zero excuses. Check out the collection yourself online at www.roxy.com or at the ROXY @ Quicksilver boutique located at 339 Queen Street West. Their active wear looks so cute! I would definitely wanna add their stuff to my expanding collection of workout gear ;) Rock climbing looks like a lot of fun too!